These five simple, yet powerful exercises take only 10-15 minutes per day of daily effort – but once mastered can dramatically increase your flexibility, suppleness and physical strength as well as mental acuity. This is a 41 page comprehensive illustrated guide to the exercises. Note: this is the pdf version – we also have a print version which we can send to you. After your purchase, you will be taken to a page where you download this book in pdf format. File size is 1.5MB. You have 7 days to download the file. The book’s clear instructions and diagrams means you have everything to get started straightaway. 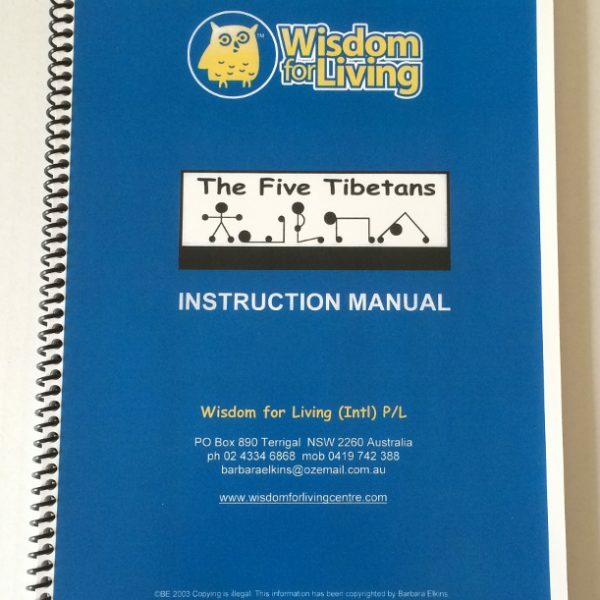 The Five Tibetans® is a very ancient, very simple set of rejuvenation exercises. They assist the body to balance itself. You will learn the five postures and then repeat them, up to 21 times each, with a special energising breath in between the sets. This routine takes about 15-20 minutes at a gentle pace. Between each set (of 21) you will learn a special energizing method of breathing. This breathing can be done at any time to help you to cope with stress and tiredness or just calm down and enliven your mind. Breathing is very important in The Five Tibetans. It is essential to learn the correct way to breathe both during the exercises and also between the sets. Firstly they were brought to the West by a westerner. Colonel Bradford, a retired British Army officer, found them in his search for the Fountain of Youth. Hence their other name… The Rejuvenation Rites. They, like many other powerful systems of ancient knowledge, had been secret. Their power being guarded by those who believed it was dangerous in the hands of ordinary people. It was in the late 1920’s when they were first taught in the West. At that time interest and awareness was just beginning to grow in all sorts of ancient esoteric knowledge. Secondly, the First Tibetan is a spin. This is not found in any other yoga. Spinning is done ritually by the Sufi masters as a passage to an altered state of consciousness; in dancing, such as ballet, and children do it, as play. Thirdly, the difference is in the fact that each exercise is repeated 21 times, as a set. 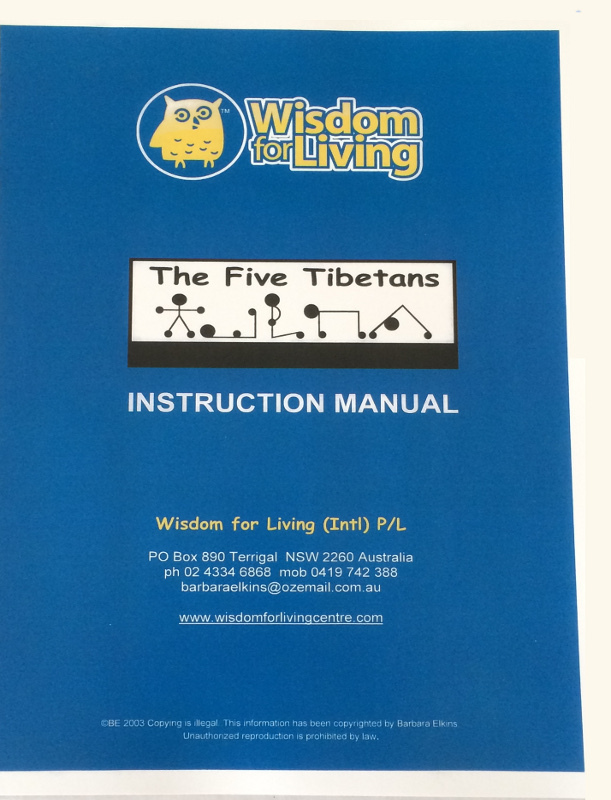 Lastly, there are only 5 postures in total. Other forms of yoga have many more postures and there are levels of difficulty. Not so in The Five Tibetans®. Just 5 that almost anyone can learn. You don’t need any special equipment or clothes. You can do them anywhere at any time you feel the need. They are very “transportable”. Very appropriate for our busy modern lives. You will look and feel rejuvenated! The Five Tibetans represent only minutes in a daily yoga practice. I have noticed clearly a large increase in energy, increase in mental alertness, strength (mind / body energy) and body tone. More focused, improvement in painful hip area. Great because it doesn’t take too much time to complete the routine. A lot slower heart rate when walking (132 down to 119) over same time and same distance. Feel stronger and more energy. The best thing I’ve done for my health for a long time. I’m ecstatic! Feel physically fitter, more energy, clarity, focus, more balanced. A good way of recharging.